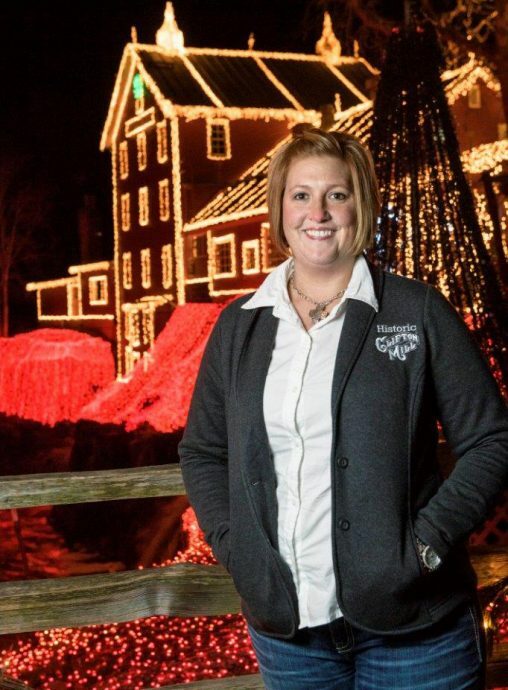 Jessica Noes had begun working at the historic Clifton Mill in high school and continued during her college years at Wright State University. When she graduated, she launched what she thought would lead to a high-powered business career in the corporate world, starting with managing a makeup counter at a retail store. But the siren song of the old mill never died. And when the owner offered to make her general manager in 2006 and “get her master’s in running her own business,” she jumped. Today, Noes oversees all operations at the mill. Her duties include staff scheduling, customer relations, accounting and marketing. Earlier this month, Clifton Mill won the top prize of $50,000 on ABC’s “The Great Christmas Light Fight,” which featured a competition among the most spectacular Christmas lights displays in America. The red, seven-story mill was built in 1802 next to the Little Miami River overlooking Clifton Gorge in the tiny southwest Ohio village of Clifton, home to about 150 people. The working mill, which grinds grain into flour, is one of the largest remaining water-powered grist mills in the land. The multilevel structure is freighted with a hopper, dust catcher, corn sifters, mixers, grinding stones and storage bins. A water turbine powers the process. A log cabin, historic covered bridge, 20-foot water wheel and a restaurant also populate the site, which sits next to a waterfall that staircases down into the gorge. Flour from the mill is used to make the restaurant’s signature 12-inch pancakes and is sold in the gift shop, which is perfumed with the smell of popcorn and soft pretzels. 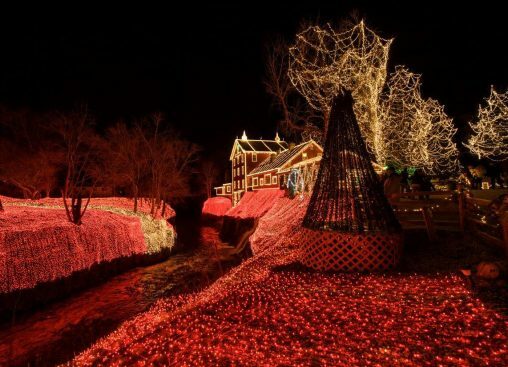 But the real jewel in the crown of Clifton Mill is its Christmas display, which has grown to 4 million lights that produce a heartstopping electric bill but dazzles visitors. The light show is the brainchild of the Satariano family, who purchased the mill 1987 and installed 100,000 Christmas lights in 1988. An eight-member crew begins putting up the lights in September. Bucket trucks are used to tinsel the towering mill and 70-foot-high trees with the bulbs. The light shows begin the day after Thanksgiving and run through Dec. 31. The electric bill for December runs into the tens of thousands of dollars. To minimize weathering, most of the lights are then taken down and stored away, a process that takes about three months. The lights have never failed to come on, but sections of the lights have occasionally gone out temporarily due to blown fuses or the tripping of circuit breakers. All 4 million lights are fired up by one switch, which is snugged into a small, wooden, padlocked box. When the switch is flipped at 6 p.m., there’s a blinding flash, and the gorge begins to glow. “There are so many ooohs and aaahs and clapping and sometimes crying,” said Noes. 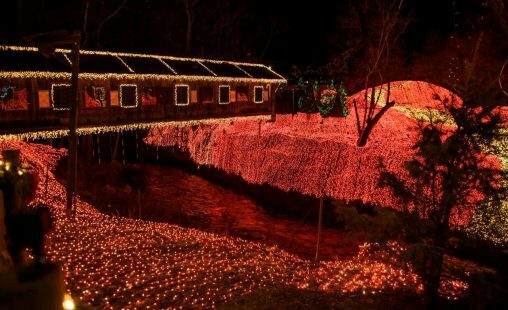 The mill also displays 3,000 antique Santa Clauses, vintage toys, a miniature village and the covered-bridge light show, which is synchronized to music. The whole thing draws tens of thousands of visitors. The mill is practically in the backyard of Noes’ family home. She grew up on a farm just outside Yellow Springs, where her father trained thoroughbred racehorses. While attending Xenia High School, Noes began working at Clifton Mill as a restaurant server. After graduating in 1998, she enrolled at Wright State and began studying accounting. But she later realized her people skills were going to waste. So she switched majors to organizational communication. All the while, she continued to work at Clifton Mill and during her junior year became weekend manager. She graduated from Wright State in 2004, pulled some time in the retail world and landed back at the mill full-time in 2006. During the holiday season, Noes manages a staff that balloons from between 20 and 30 to about 40. She has learned to become a jack of all trades and fast on her feet. The mill and its romantic charm have played host to numerous weddings over the years. Couples who get engaged at the mill are allowed to carve their initials on the covered bridge. “It’s unbelievable how many people have had their hearts touched by this place,” said Noes. Noes even once witnessed a group of people using the water wheel to spreading the cremated ashes of a loved one into the river. “That was a crazy one,” she said.